The Aluroller SF ... state of the art. Reynaers’ acquisition of a 3D scanner and a thermal insulator and assembler has reinforced its claim of applying cutting-edge technology in bringing the best to its clients and the aluminium profiles market. The new Coordinate Measuring Machine (CMM), an advanced 3D scanner, has been installed in the quality testing laboratory (Q Lab) at the headquarters of the European provider of sustainable aluminium systems to assess profiles and accessories; while the revolutionary Aluroller SF is used to thermally insulate and assemble aluminium profiles. “These two major investments will help Reynaers sustain its market leadership and are in line with company’s commitment to investing in hi-tech quality testing and insulation technology to improve accuracy, quality and production efficiency,” says Ali Khalaf, managing director of Reynaers Middle East, the regional office of the Belgium-based company. The CMM will test the strength of profiles, layer thickness, gloss and adhesion of lacquers, performance of support gear, dimensions, scratch measurements and hardness of aluminium, among other aspects. “This is the first time that a scanner of this kind is being used in the aluminium window/door industry,” says Khalaf. The scanner allows Reynaers to measure newly developed profiles and accessories precisely and to compare them with the original design specifications. It can measure all new prototypes during development to perfect them as well as all first deliveries of newly-developed profiles and gear to check tolerances against the original design. The CMM’s non-contact laser probe is a new technique to inspect the dimensions and geometric shapes of profiles and accessories. It measures accessories automatically and replaces older manual measuring with calipers and profile projectors. Scanning results are combined with CAD data to compare products with the theoretical design dimensions and tolerances. An advanced sensor probe serves as a contact high-precision measuring head to outline the contours of multiple samples in one movement and in 3D. The contours will be evaluated with the CAD data in order to approve or reject prototypes without having to flatten or remove inflections of aluminium samples. The CMM’s accuracy enables Reynaers to comply with ISO standards, ensuring lower tolerances and better alignment of parts at installation, he says. The scanner will supplement Reynaers impressive arsenal of lab equipment that includes, amongst others, the aluminium hardness tester Brinell, where measurements are obtained by forcing a bullet into test material. The hardness of the material is determined from the intrusion. A profile projector measures dimensions and matching tolerance fields on profiles and gaskets. Test samples are enlarged tenfold by a lens and then manually measured. The Romidot measures dimensions and matching tolerances on profile prototypes and first deliveries. A 2D picture of the intersection of the profile is made with a scanning device, after which the picture is automatically compared with the technical design drawing and tolerance fields. 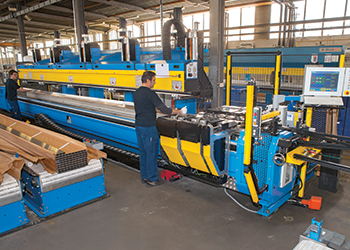 Reynaers has also launched the state-of-the-art Aluroller SF at its plant in Duffel, which is claimed to be the biggest insulation facility for aluminium profile production in Europe. The launch of the unit with Belgium-based Aluro, a world leader in machine building, follows six years of development. “This machine is far ahead of its time, incorporating the production principles of ‘lean, smart and green manufacturing’ in one entity. It is highly automated to deliver 10 to 20 per cent faster running times, has zero defect tolerances, is easy adaptability and offers faster setting times to insulate new designs and different frames without human intervention. “The Aluroller clamps profiles completely into position over their entire lengths during assembly, ensuring the profiles remain 100 per cent stable. Older machines required a correction mechanism through which warped profiles would subsequently be corrected, leading to internal stress within the profiles. These stresses often later cause the profiles to warp again, leading to maladjustment of corners and poor workmanship,” Khalaf explains. “The Aluroller SF is now the only machine in the world to consistently deliver correct, stress-free insulated aluminium profiles and for the first time right with zero defects. It also allows for quick conversion from one to the next kind of profile with its own specifications and measurements,” he stresses. Established in 1965, Reynaers Aluminium provides innovative and sustainable architectural aluminium solutions including a wide variety of window and door systems, curtain-walling, sliding systems, sun screening, conservatories, skylights, screens and systems to incorporate blinds and ventilation grids. Reynaers Aluminium has offices in more than 30 countries worldwide.